The legendary 99-meter yacht Christina O that belonged to Greek shipping tycoon Aristotle Onassis has docked at Piraeus Port as a stop on a Mediterranean cruise. The yacht owes its fame to the great personalities and historic figures who sailed on the ship as guests of the Greek shipping magnate. Winston Churchill, King Faruk of Egypt, Marilyn Monroe, Elizabeth Taylor and Richard Burton, John F. Kennedy, Frank Sinatra, Prince Rainier and Grace Kelly are some of the people who enjoyed the luxurious hospitality of Christina O. The old Canadian war frigate was converted into a yacht by the Greek shipowner in 1954 at a cost of $4 million at the time; Onassis had initially bought it for a few hundred thousand dollars. It was originally called Christina, after the shipping tycoon’s daughter. When Onassis died in 1975, he left the yacht to his daughter. 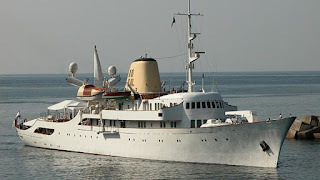 Christina Onassis donated it to the Greek state to be used as a presidential yacht. It was renamed Argo by the Greek government at the time, but it was soon abandoned and left to rust. In 1998, Greek shipowner John Paul Papanicolaou, a friend of the Onassis family, bought it and renamed it, adding the O to the original name of the ship. Papanicolaou refurbished the boat from 1999 to 2001, spending over $50 million, according to reports at the time. From 2005 and on, Christina O was available for charter, for about €450,000 per week. Date : 6/19/2018 05:53:00 μ.μ.